Welcome to the “Pass A Smile” web site. Hopefully many of you visiting this site were directed here by a random act of kindness from someone participating in the “Pass A Smile” concept. So who am I and what is the “Pass A Smile” concept? My name is Eric Ligman and I am a Global Partner Experience Lead in the Worldwide Partner Group at Microsoft, focused on improving the satisfaction of and relationship with our Microsoft Partners around the world. 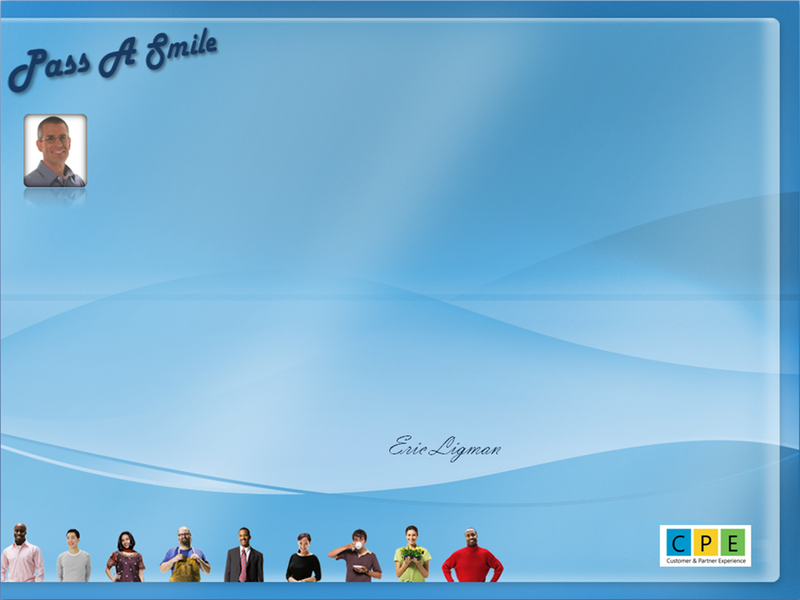 I decided to start the “Pass A Smile” concept on a basic premise: If each person were to perform just one random act of kindness each day that brought a smile to a complete stranger’s face, imagine what an impact that would have. Plus, if those complete strangers then “passed the smile” onto someone else by performing their own random act of kindness for another person, the effects would compound immensely. So, if you find yourself here because of someone else’s random act of kindness towards you that brought a smile to your face, ask yourself, can you “pass that smile” onto someone else today through your own random act of kindness? Or, maybe you can initiate the effort with your own random act of kindness today or tomorrow to try and start a chain reaction of good deeds. Also, if you have a great story of a random act of kindness you would like to share with us, we would love to have you send us your story. Here’s wishing you many smiles as you go through your day.